Ci-dessous quelques illustrations de ces ancétres de chariot élévateur via la Nouvelle Zélande.  Nous avons rajouté quelques autres trouvailles dans le tableau en page. Man has always looked for easier ways of accomplishing difficult strenuous tasks and one can easily think back to the Stone Age man and the invention of the lever. It was Archimedes who finally recognised the importance of the lever and his famous statement "Give me but one firm spot on which to stand and I will move the earth" is well known. We doubt that he was thinking of modern day fork lifts when he said that and indeed it was to be many years before they were developed in the United States. In the 1800's basic manually powered sack trucks were developed and are still in use to this day! As goods became more diverse other types of hand operated equipment were developed - platform trucks and four wheeled trailers and the like. Powered versions did not appear until the beginning of the 20th century and were driven by electric motors powered by traction batteries. Safety was definitely not a consideration in those days but they did assist in getting the job done and later types were made with a platform which could be electrically raised and lowered. It was the first world war that made this equipment popular mainly due to the shortage of labour. After the war the designers decided that putting loads on top of each other would be rather a good idea and so a high lift version of the platform truck was produced. 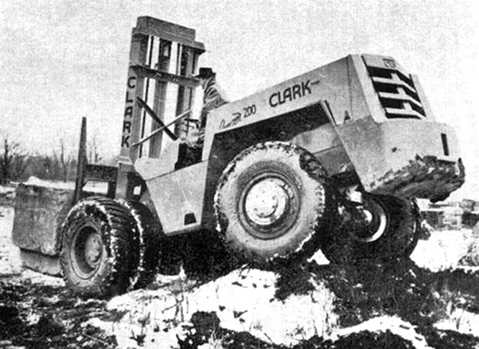 Clark are credited with producing the forerunner of the seated counterbalanced truck in 1917 but it was Yale that, in 1925, produced the first electric truck that had raising forks and an elevating mast. No tilt was fitted to the machine and the lift was by ratchet and pinion as hydraulic systems had not been incorporated into trucks at that stage. At first industry was slow to take up the idea but the advent of the second world war soon made the fork lift truck indispensable for loading vast quantities of war goods onto wagons and ships etc. The fork lift tuck had finally arrived! After the war British industry started importing trucks from the USA and they were used mainly for outside applications but then in in 1946 the first truly British company, Coventry Climax, produced the first fork lift truck and the rest as they say, is history. 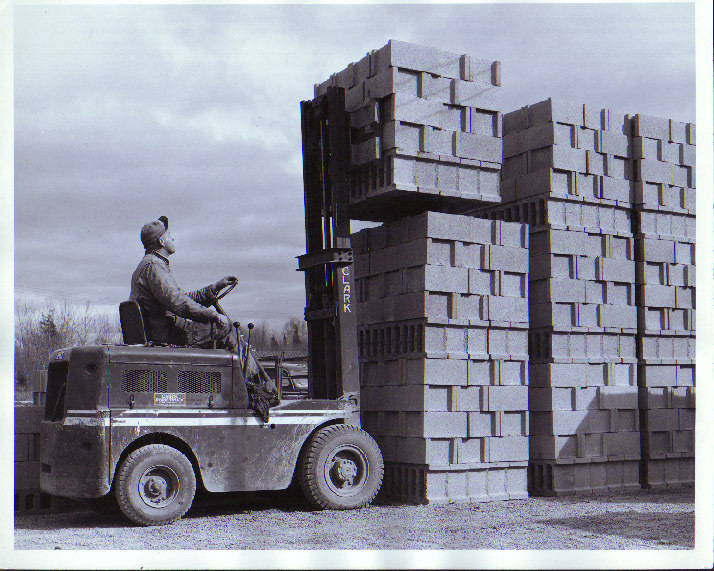 One company who had a very significant impact on the UK truck industry was Lansing Bagnall who took the counterbalanced truck re-designed it and produced the worlds first reach truck for use in narrow aisle applications. Trucks nowadays are more sophisticated with complex electronic and hydraulic systems, high visibility masts and with comfort and safety for the operator paramount. Click on picture for enlargement. Chariot élévateur é fourche Automatic é moteur 72 volts. Chariot élévateur é fourche Automatic é moteur 72 volts. - Ce moteur de 72 volts, é circuit de commande rapide, permet é un chariot élévateur é fourche standard Automatic alimenté par batteries d'effectuer du travail lourd pendant de longues périodes. Modéles pour chariots d'une puissance de 3000 é 10000 lb (1360 é 4535 kg). Ce systéme permet d'obtenir des chariots de levage les mémes prestations qu'avec un moteur é essence. On emploie un démultiplicateur é 6 vitesses. Le chariot peut atteindre é pleine charge une vitesse de 15 km é l'heure. Le conducteur peut choisir entre une manéuvre de lavage lente ou rapide. Constructeur: Automatic Lift Truck Division, Chicago 20, Illinois, Etats-Unis. CHARIOT éLéVATEUR A FOURCHE A QUATRE ROUES DIRECTRICES. Chariot élévateur é fourche, force 20 000 lb. (9 070 kg), quatre roues directrices é pneus, commande de la direction assistée. Conéu pour travailler dans des conditions trés dures dans la boue et en terrain accidenté. Quatre vitesses, transmission é puissance variable et convertisseur é torque avec rapport 3-1 sur un moteur diesel General Motors de 143 CV. Peut étre livré avec moteur é essence. Direction sur quatre ou sur deux roues par action sur une manette. Une seule manette sur la colonne de direction commande le levage et les mouvements de bascule. Caractéristiques. 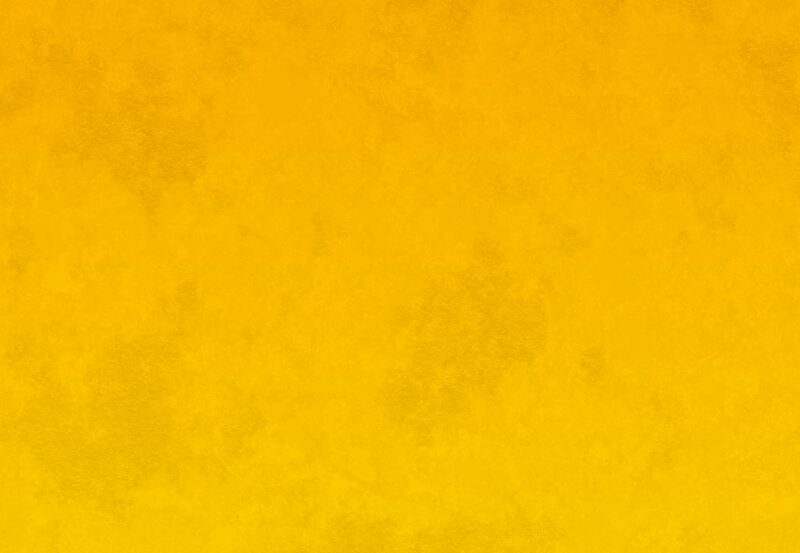 Garde au sol: 14 in. (36 cm); vitesse: 25 mph (50 km/h), en marche avant et arriére. Rayon de braquage: 312 in. (7,92 m). Empattement: 108 in. (2,74 m); longueur (sans la fourche): 207 in. (5,26 m); poids é vide: 32 470 lb. (14 730 kg). Pneus: 14 x 24 in. CHARIOT éLéVATEUR A FOURCHES LATéRALES IRION. - Puissance 3000 kg pour un centre de gravité de la charge situé é une distance de 600 mm. Longueur des fourches, 1200 mm. Chéssis en poutre-caisson; moteur Mercedes-Benz Diesel, 4 temps, 4 cylindres. Puissance 30 CV, é 2500 t/m. Embrayage mécanique. Vitesse de marche: 1re 4 km/h 2e: 7 km/h; 3e: 11 km/h; 4e: 17 km/h, 5e: 25 km/h. Marche arriére: 4 km/h. Commande hydraulique: pression de marche, environ 160 atm. sous 3 t. de charge. Constructeur: Albert Irion, Nachf., Stuttgart-Ménster (Allemagne). Logistics have always played a pivotal role in the development of successful civilisations. For example, one can imagine how vital it was for the Romans to have an efficient supply chain to sustain the huge armies controlling their vast empire. This would have required sophisticated forward planning and construction of storage and distribution facilities. Transportation by oxen, and by sea was slow and the empire ran without any of the advantages of mechanisation. Today, we take for granted the easy and constant availability of our groceries, fuel and consumer products, on virtually a 24hour basis, without much thought about how the goods arrive at the retail outlet - even though our daily lives are dependent on this availability. Behind the scenes, complex and highly efficient storage and distribution infrastructures are effectively the life support system for modern societies. Without them chaos would rapidly ensue. Mechanised material handling is in fact a relatively new industry and originated in the USA. It was in the early 1940's that the first tentative efforts were made to develop an alternative to manual handling in the UK. For it did not escape the notice of young entrepreneurs that the American liberty ships, providing vital wartime supplies in the early 1940's, were using forklift trucks to unload their cargoes, rather than the labour intensive manual methods in use at British ports. 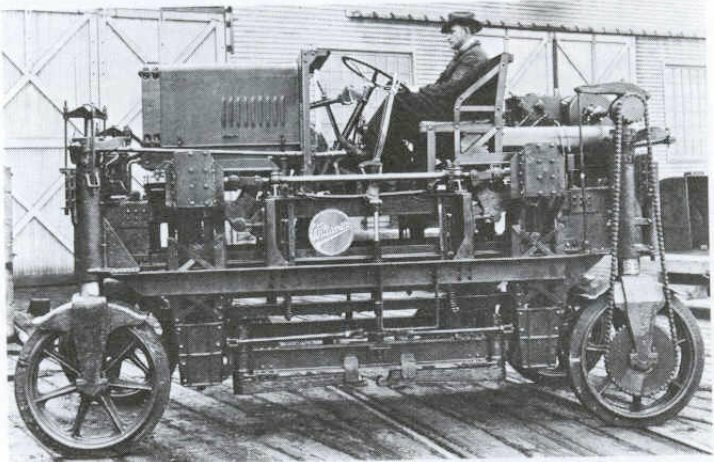 One of the pioneers was Lansing Bagnall (Lansing Linde today) who were among the first UK companies to design and develop tow tractors, for British Rail, and powered pallet trucks which transformed the internal transport of products to bring unheard of levels of efficiency. 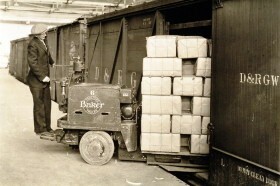 Subsequent models included the first stand-on moving mast reach truck, which was revolutionary in its time, enabling goods to be stored to a much higher density than had ever been possible previously, and in aisles of less than 2.5 metres. In those exciting pioneering days it was necessary to sell the handling concept as well as the product, since such methods of storage was unknown and the market had to be created. Trade unions saw mechanisation as a threat to their members and some companies were not initially convinced of the benefits. In spite of these challenges, the early pioneers preserved and continued to develop new types of handling products, leading to the first mechanical exhibition held in London in 1948, which highlighted the economical advantages of mechanised muscle to a much wider audience. 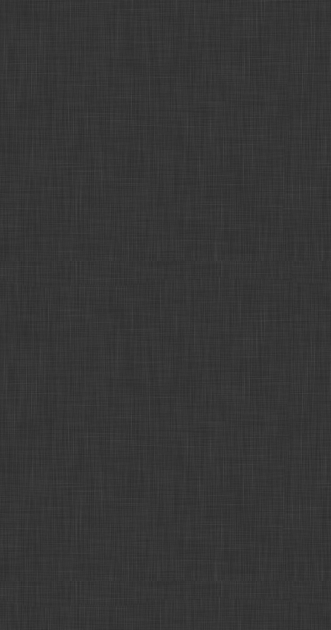 Designers in those days had to work within the restrictions of the available technology, while at the same time researching new ways to advance and improve in this area. Early control units for battery powered units for example, were large and not very energy efficient, existing as they did of heavy wiring and a series of contactors. Power steering, and even overhead guards were a rare luxury, while seats were very basic and usually without suspension, but one has to remember that at that time, virtually all goods were moved manually, so any mechanical assistance was a major step forward. In a relatively short space of time, there were amazing advances in engineering and electronics applied to the development of materials handling equipment, leading to significant improvements in performance and efficiency. As consumer demand grew, so did the need to create more efficient distribution and storage, which in turn lead to the development of high lift reach trucks and very narrow aisle system trucks and order pickers. 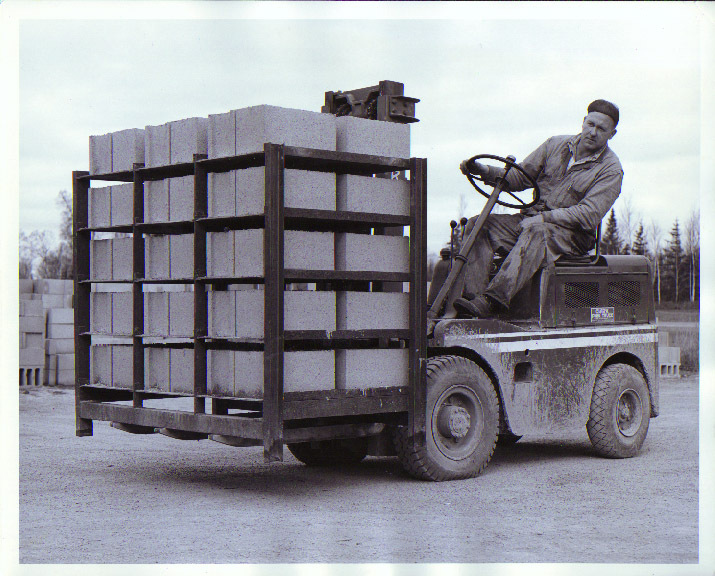 Lansing Bagnall developed the first man-down turrett truck, which enabled aisle widths to be reduced to less that 1.5 meters and in the 1960's was already producing prototype man-up combi trucks. The introduction of ISO containers to ships products, created a demand for specialist container handling trucks for ports and terminals, while smaller capacity engine trucks were produced to handle increasing volumes of palletised and pallet-less loads in a wide range of industries. With economic prosperity, came the ever increasing demand for efficient, reliable distribution, which required the creation of warehouse and inventory management systems, and which also optimised the performance and efficiency of the materials handling equipment. Today, modern materials handling equipment from leading suppliers is comfortable and quiet in operation and has built-in diagnostics. Low maintenance requirements and energy efficiency are also essential features together with versatility and local after sales support. Those early pioneers founded a major industry, which influences our daily lives. Everything we eat or wear, and everything in our home, including the materials to build the house itself, has at some stage been stored and handled by materials handling equipment. An interesting fact to ponder when next you see a forklift truck.!! The hyster company story: "Starting a new business is never easy. In 1929, it was harder than usual." - Ernest Swigert, Founder of Hyster Company. Just before the Depression began in 1929, a small machinery company was established on a back lot in Portland, Oregon. 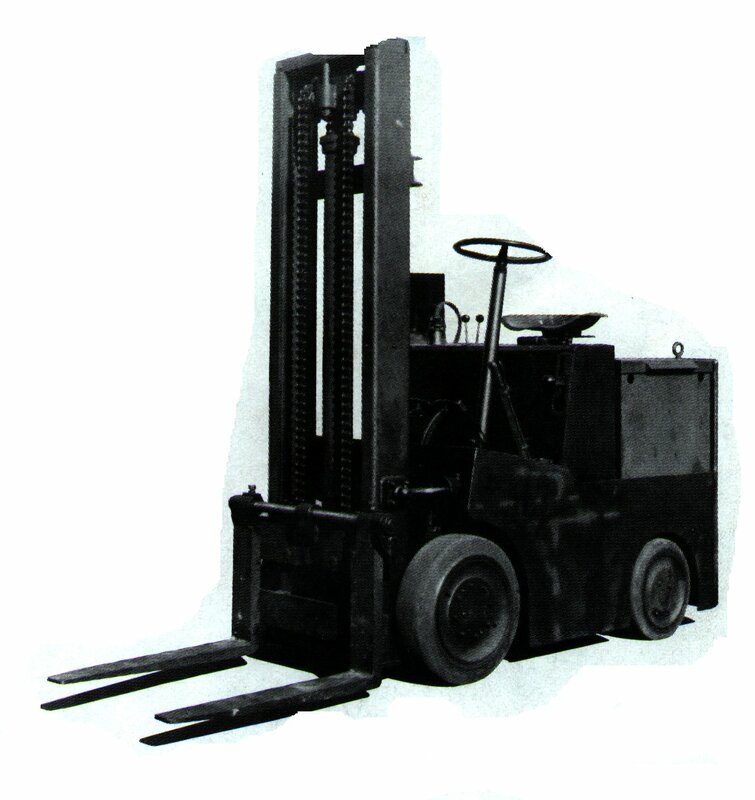 It didn't make lift trucks --- The term "lift truck" didn't even exist then. But the machines it did make soon earned a reputation for being rugged and tough, able to take the rigorous punishment of the region's logging industry. One of those products was a winch, or hoist, called a "Hyster." It was called that because a foreman in the woods or on a loading platform would wait for the load to be engaged, then tell the winch operator to "Hoist'er". That sturdy winch proved to be only the first of many reliable material handling ideas to come. Times were rough those first few years. Luckily, the company's leadership was up to the challenge. Its president, a young Harvard-educated metallurgist named Ernest G. Swigert, believed the company's future depended ultimately on the value built into its products. He made it his job to make sure it was there. He also saw that the young company searched vigorously for new product ideas, suited to its customers' needs. Besides winches, it developed tractor-drawn logging arches to move huge logs more efficiently, and straddle-type lumber carriers. By 1934, experiments were underway with unusual-looking trucks fitted with lifting forks at the front. Before long, the young company would emerging from its economic uncertainty and entering the dawn of the lift truck age. Yale is loaning what they believe is one of the oldest éworkingé fork trucks in existence, to the FLTA Heritage Centre, which is based at the Midlands Railway Centre. The truck was manufactured in 1926 and brought to the UK in 1938 as part of the armed farces supply requirements. Possably the oldest working truck in NewZealand.... Unless you know better of course. 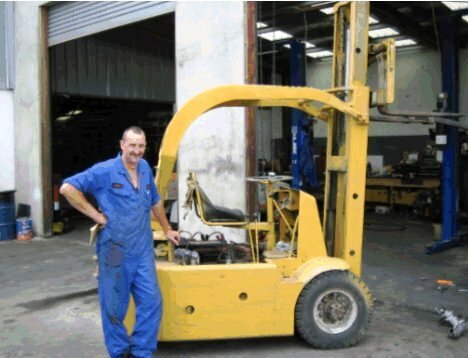 Is this New Zealandés oldest Hyster? If you know of any older ones, please contact Craig Armstrong-Fray at Gough Forklifts, on 03 983 2433, or email craig.armstrong@ggh.co.nz. If you have an article or a picture that you think is worth putting on this page then please send. 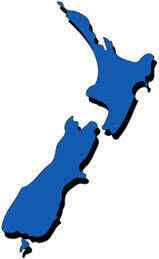 If it is leading to a web site that is relevant then we will of course put your link in as well.